15 Best Deadbolt Locks Reviews & Best Door Locks in 2019! We are all interested in protection of our families and houses. The deadbolt locks are designed to secure our doors and prevent an unauthorized entry. There are two main types of locks on the market – the conventional deadbolts and the smart locks. 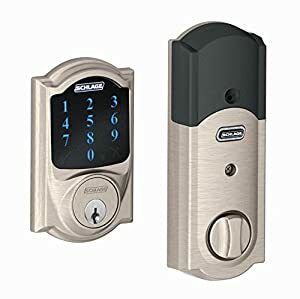 So what is the most secure door lock? Each type has its advantages, so let’s review them. Conventional deadbolts are simpler; they provide no special functions, except for keeping your house safe. They are well-constructed and durable, usually single-cylinder locks. There are double cylinder deadbolts, specifically designed for the doors, which are placed near the window. They prevent the forced opening through breaking the window. These items are usually not very expensive and they are easy to install. I’ve picked several options among the conventional deadbolts. Kwikset Single Cylinder Deadbolt is designed to protect the exterior doors of the house. It features SmartKey technology and re-key technology. You can easily re-key the lock by yourself in seconds. If you’ve lost the key, there is no need to buy a new lock; you just re-key this one. 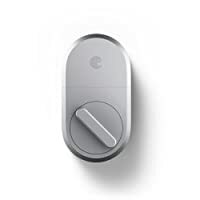 The SmartKey technology gives you an opportunity to control who has the access to your house. The protection against bumping is ensured by the BumpGuard system. This is a patented side locking bar technology. The deadbolt is operated by the key from outside. From the inside, it is operated by the thumb turn through the turn button. This is very convenient in terms of security. In case of fire, you can easily and quickly leave the house. This lock will perfectly fit all standard door preparations, because it features an adjustable latch. This item is very durable and reliable, because it is ANSI- and BHMA- certified (grade3 certification). Due to the functional and ergonomic design, this lock can be mounted on the right side of the entry door. 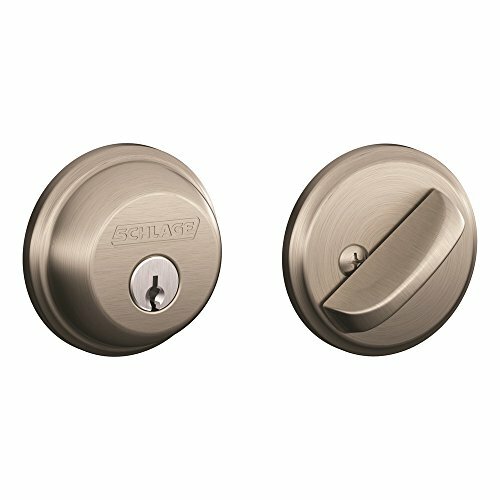 This deadbolt is covered with satin-nickel finish for the increased practicality and the stylish look. This lock is key-operated only from the outside of the house. On the inside, it is operated by a thumb turn. It is very convenient, for example, if your guests are leaving, they can easily open the front door from the inside. An easy installation is provided by Snap’n’Stay construction, which tightly holds the deadbolt in place. It fits all standard door preparations and pre-drilled holes. This item is very reliable, because it is one of the grade-1 door locks. This deadbolt features an adjustable latch. The construction and finish of the item are very solid. This item is ANSI/BHMA grade-1 certification. It will protect you from attacks by crowbar, hammer, wrench, lock pick, kick-in or saw. 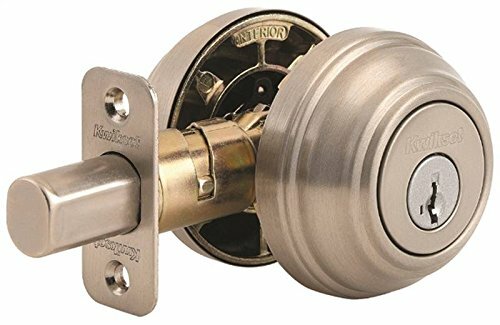 This single-cylinder deadbolt is produced from Brass and covered with Satin chrome finish. It is weights 2.2 lbs because of the durable material and solid construction of the item. Every lock comes together with two keys. This deadbolt is designed to fit all door preparations with thickness from 1 3/8” to 2”. All the levers are solid and feature no inserts. They meet the Federal ADA and State disability requirements. The constant-lever return is provided by the individual heavy-duty springs of the lever trim. 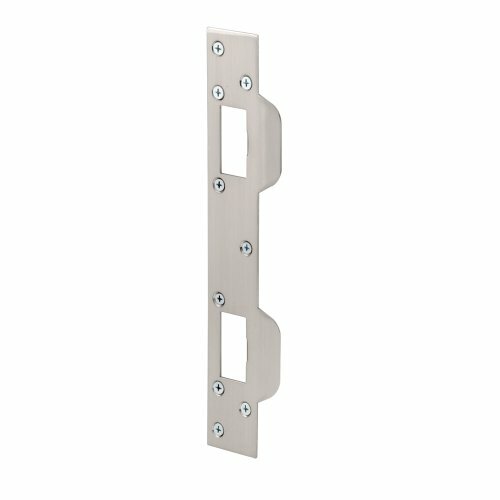 The trim is through-bolted with screws to the maximum strength and loosening-resistance. This item meets ANSI/BHMA grade-2 certification for the key-in-lever locksets. 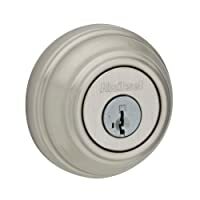 It is one of the best deadbolts on the market. This double cylinder deadbolt combines a stylish design and high functionality. It is produced to secure your exterior doors with keyed access. It is operated with a key from both sides. There are two different keys – for the inside and outside locking. It features SmartKey technology, which allows you to re-key your door lock by yourself in seconds. So if you’ve lost your key, there is no need to buy the new lock. This door lock fits all the standard door preparations, because it has an adjustable latch. The BumpGurad technology protects your door lock from bumping. The item is well-constructed and very sturdy. 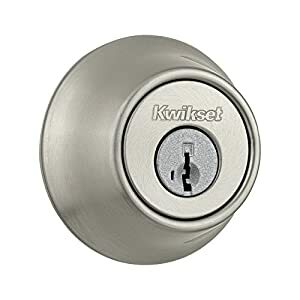 This is another great product among the front door security locks by Kwikset. It provides security to your house, because it is reliable and functional. This door lock is key-operated on both sides of the lock. The double-cylinder technology is perfect for the doors that are close to a window for additional security. This lock also features SmartKey technology, which makes life much easier, because you can re-key you lock easily. The item has an adjustable latch and fits all the standard door preparations. It is ANSI/BHMA grade-2 certified. Does not have a latch on the inside part of the deadbolt. If you want to increase your house protection even more, then there are two more options for you. The door strike provides extra strength to the door locking system. And the reinforcement lock prevents the door from bumping and kick-in. 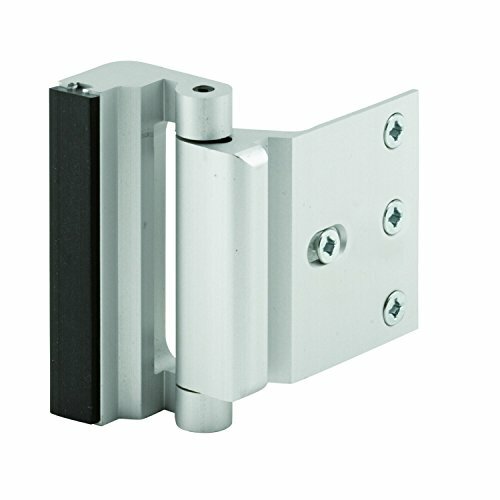 This is a well-constructed high-quality stamped steel security combination strike. It provides an increased security to your house due to its functional features. It is covered with a satin-nickel finish for the maximum durability and practicality of the item. This door strike features a taller latch and bolt openings. They can easily accommodate the door hardware positioned from 5-1/2” to 6”. This strike replaces the standard separate latch and deadbolt strike with one-piece plate and provides additional protection. The item comes with screws and installation instructions. It is a solid construction which gives extra strength to your door-locking system. Another item providing additional security to your house locking system is Defender Security U 10827 Door Reinforcement Lock. It can withstand 800 lbs of force; which makes it very strong and reliable. This item prevents lock bumping and picking while in locked position. The design of the item is child-safe. It is tamper-resistant and very easy to install, but requires a drill. A great advantage is that it cannot be opened from the outside. This item is advised to install on secondary entrances, to increase security while you are away. This lock meets Texas building code requirements. 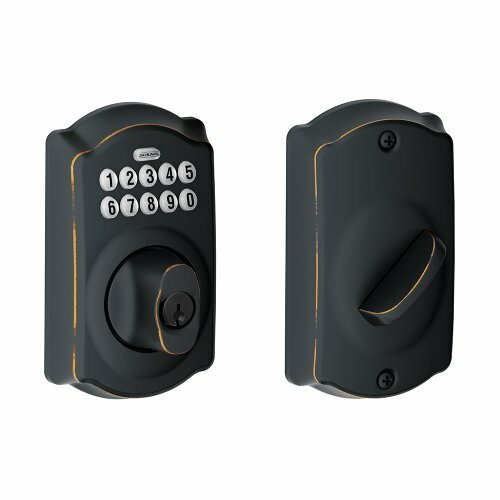 These door locks provide lots of customized functions, such as remote control, unique pin codes, activity tracking via smartphone application. They can be connected to the house automation system for the user convenience. The majority of the electronic door locks use Bluetooth technology to recognize your smartphone when you arrive. If you want to connect it with the Internet, you will need an additional Wi-Fi hub. 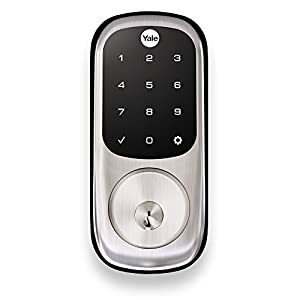 If you’re interested in a comfortable keyless entry, you might want to consider buying an electronic deadbolt. 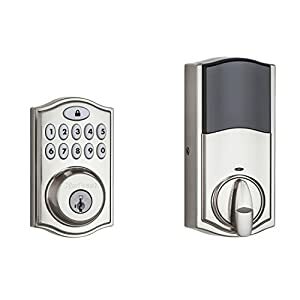 Among different electronic deadbolts, Schlage Z-Wave Connect Camelot Touchscreen Deadbolt with Built-In Alarm is definitely worth your attention. It works with Amazon Alexa, but please note that you will need to by the Alexa device and the hub separately. The ergonomic design of this item features the touch screen keypad and the lock cylinder on exterior. This lock can be opened from the inside by the thumb turn. The touch screen is durable, because it is protected from fingerprints with the matte finish. The touch screen allows you to go keyless. The electronic deadbolt allows you to set up the personal 4-digit code for each family member. You can store up to 30 personalized user codes on this device. The lock is operated by the batteries. It fits all the standard door preparations. There is a built-in alarm with 3 alert setting for the additional protection of your house. This is an audible sensor system, which alarms you in case there is activity at the deadbolt. There are three possible modes of this alarm system; you can choose the most suitable one. Another advantage of this deadlock is Z-wave technology. This advanced remote management system allows you to lock or unlock the door remotely through your smartphone or via the web. It is connected to your home automation system. This item is ANSI/BHMA grade-1 certified for the highest residential security. The item comes with installation instructions, a user guide, four AA batteries and one back-up key. 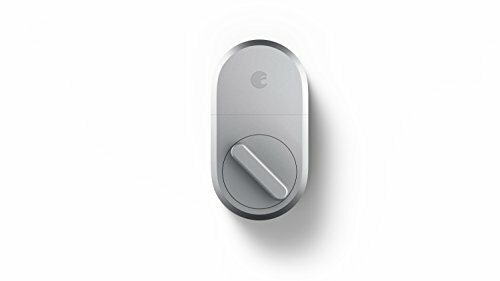 August Smart Lock allows you to operate it easily using your smartphone. You can lock and unlock the door and create virtual keys for your guests. The track of people coming and leaving is kept, so you can check it anytime you want. 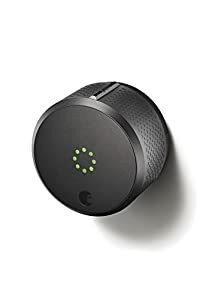 This deadbolt works with Amazon Alexa, but it is sold separately. There is an auto-lock and auto-unlock feature which is very convenient in use. The door is automatically locked behind you and is unlocked when you approach the door. This feature can be turned off. This excellent Bluetooth door lock works with Android and iOS smartphones equally well. But if you’re using an iPhone or an iPad, you can control smart lock with the help of Siri. 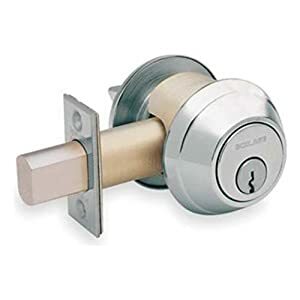 This lock is battery-operated, so the installation requires no wire connections. The August app will notify you when you need to change the batteries. It connects to your smartphone via Bluetooth (Low Energy Bluetooth). Last but not least, your exterior door will remain the same. You can easily replace only the interior side of the standard deadbolts. This electronic deadbolt is operated by AA batteries that you should buy separately. But the batteries-operated locks are easy to install, because they require no wires. This item is extremely reliable, because it features Bump-proof and pick-resistant side-locking bar technology. 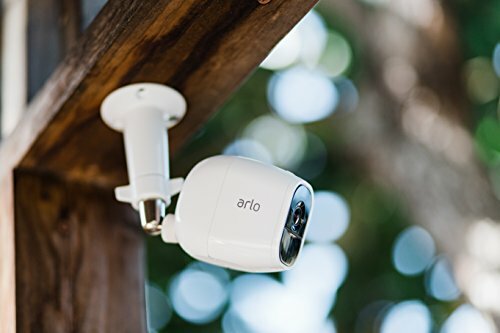 This item works with Amazon Alexa, but it doesn’t work with Zigbee and Xfinity. It features customized 30-second automatic door lock. If you forget to lock your door, it will lock automatically. The Bluetooth door lock fits the majority of the standard door preparations (1 3/8” – 2”). Z-wave technology allows you to connect wirelessly your lock to your home automation systems. It provides the keyless entry convenience. You can save up to 30 digital codes and one master code to provide additional security. And you can remotely control your lock from anywhere. 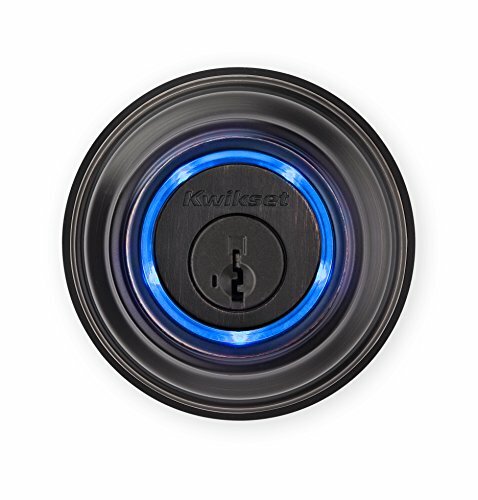 This item features SmartKey technology, which allows you to re-key the lock by yourself. This lock is BHMA grade-2 certified and UL-certified. Kwikset 909 SmartCode Electronic Deadbolt is a high-technology reliable item, which features one-touch locking. 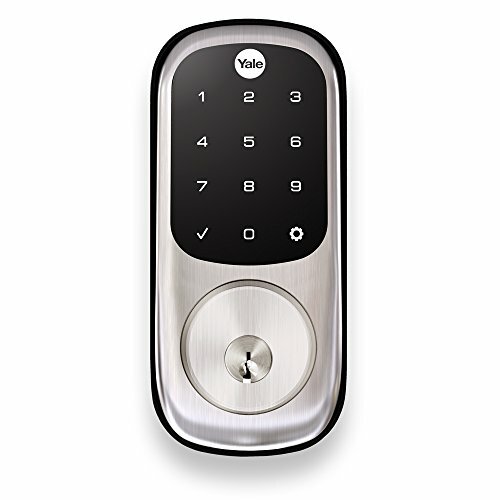 The deadbolt is motorized and has the back-lit keypad for the additional visibility. There are eight possible customized codes and one master code for the maximum safety. This deadbolt provides the keyless entry possibility for each member of your family. The installation of the smart deadbolt is really easy and takes several minutes, because it requires no wiring. It fits standard 1 3/8” – 1 ¾” doors and need no screw holes. There is an auto-lock option – you can set it to lock the door automatically in 30 seconds. It is produced from metal and is covered with temper-resistant finish. This is a great smartphone door lock, because it combines high-technology systems with the durable materials. Your smartphone is the key to your door. Additional protection is ensured by the fact that Kevo tracks user activity in the system. It features the second generation Kevo for one-touch opening. If you want to connect it to Amazon Alexa device, you need to buy the Kevo plus hub separately. This hub also allows a remote control of your door lock. The Kevo app is really fast and ensures a reliable connection with your lock. This item works with traditional key based on the SmartKey technology, which allows you to re-key the lock by yourself. The door lock will open after one touch, because Kevo recognizes your smartphone without taking it out of pocket. When you’re at home, Kevo remains locked. If you’ve lost your phone, you can easily disable its access through online account. Kevo is ANSI grade-2 certified, BHMA-certified and UL fire-rated. The installation is easy, takes several minutes and using a screwdriver. It fits standard doors – 1 – 3/4″. This electronic door lock has several advantageous features. It unlocks the door automatically when you arrive, because it recognizes your smartphone, providing a keyless entry. It also locks automatically when you leave. The August home app provides a track activity, so you can always know who comes and leaves your house. The lock is easily installed with the help of a screwdriver inside your door. It works with the majority of single-cylinder deadbolts. It is batteries-operated and requires no wiring. It features the door sense, which indicates whether the door is locked or not. 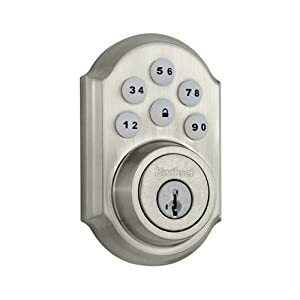 This keypad deadbolt lock provides the comfortable keyless entry. The touch screen keypad allows you to open the door using the unique pin code. This door lock features Z-wave technology, which allows you to integrate it with home automation or alarm system. With this technology, you can monitor, lock or unlock, create a pin code or block access to your door from anywhere. The tracked activity will be shown as smartphone notifications, which is really convenient. The installation requires no wiring or additional holes, it is performed with the help of a screwdriver. A high level of customization allows you to turn on the privacy mode, when all codes are locked out or use voice-guided programming. There is also auto re-lock feature. Among the front-door security locks I should definitely name this one, because it combines high functionality and ergonomic design. This deadbolt lock is operated by batteries and requires no wiring, that’s why the installation is quite easy and quick. It fits all the standard door preparations. The touch pad is silicone-coated to protect the numbers from wearing off. This is a nice feature to increase the safety. You can easily create access codes for your family members and friends. The capacity is 19 unique user codes. The lock is pre-programmed with two codes for immediate use. There is an indicator showing the battery running low. The keypad is back-lit, so you’ll get all the necessary visibility despite the light conditions. Additional protection is ensured by alarming system. If you enter an incorrect code, you will hear the warning sound, and the keypad will block for 30 seconds. 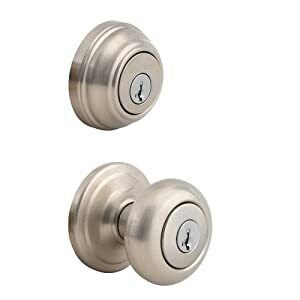 I hope that this article was useful and provided you with all necessary information about the best deadbolts. There are lots of options on the market. If you are looking for the keyless entry, you might be interested in the electronic door locks. You might combine them with a single or dual cylinder door lock for the additional protection. You literary can’t be too protective when it comes to the security of your family and your own security. If you want to know how to choose the best locks for storage units, you might want to check out this article about best locks for storage units. Looking For a Bump Proof Locks Advice? Here’s Your Guide!